Is It Ok To Kill Articles That Get It All Wrong About Cyclists? Quite often I get these emails and texts from people alerting me of an article I should read about cycling. Often it’s from a credited publication like the NY Times so naturally it peaks my interest. Turns out, 9-10 times the op-ed or discussion is about some out-of-touch person who really doesn’t like biking and probably shouldn’t even be writing an article that does nothing for the activity but rather makes cycling hating drivers feel justified for their road rage or cycling enthusiasts defend themselves for their choice of transportation. As one of the laters I often feel obligated to chime in since the article itself is getting attention and it’s my job to help defend cycling. Luckily most of the time the arguments are weak, so my job is made easy. It’s also quite baffling how these people are given the word space, especially with the current state of publishing in the digital age. The latest comes from some guy named Daniel Duane from San Francisco who was fortunate to have his opinions published in the New York Times on Sunday. I’m not sure a triathlon is the best place to start cycling…seems a bit extreme, how about just going to get a delicious burrito in the Mission or a leisurely cruise across the Golden Gate bridge. Yeah it’s called learning how to operate a vehicle, just like when you stalled in traffic on one of those hills trying to learn how to drive a stick shift. Oh the embarrassment. The rest of this op-Ed goes on to point out how easy it is for cyclists to get killed by automobiles with little or no criminality attributed to the driver. Now being killed by a car for learning how to love cycling is a very hard lesson to swallow. I don’t want to belabor over the East Coast vs West Coast thing, but really. One of my Co-Author of the book we did as a travel guide for biking in NYC, (bikenycthebook) Marci Blackman would often talk about biking in San Francisco where she lived for a long time. She would say she felt way more safe in NYC and that in SF the drivers have much more space to speed and how cyclists are treated much more as just being in the way. After all, just cause it’s up North and the birthplace of free lovin hippies, it’s still car culture America, California. 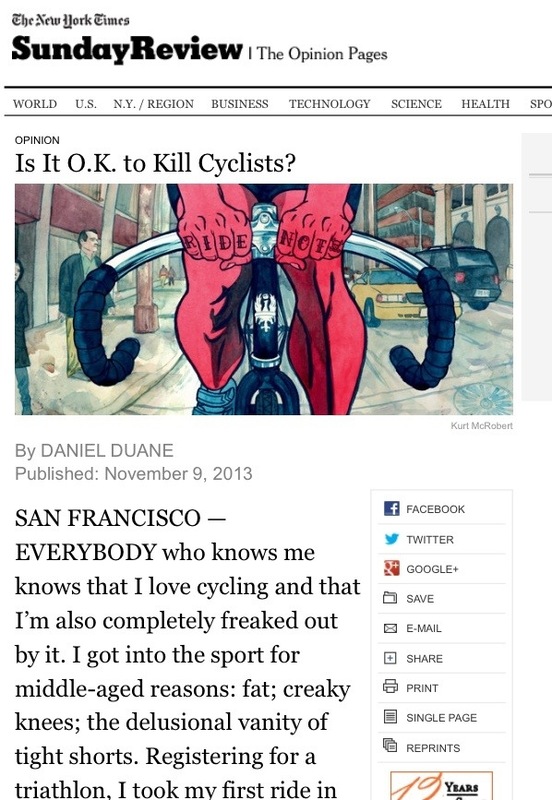 Continue reading Is It Ok To Kill Articles That Get It All Wrong About Cyclists? Today a celebration of bicycle infrastructure good for all our families. In the age of the SEC shredding evidence of corporate wrongdoing and big telecoms demanding pension cuts (Verizon) while recording record profits…here in NYC it’s win one for the little guy. Battle of the Bike Lane, Joel Epstein and more. Joel Epstein is a reporter who’s covers bike related issues. Here is his latest article in Huff Post, talking about our local politicians tone-deafness towards real sustainable change and the battle over a bike lane. Not sure the angry residents and Brooklyn Borough President Marty Markowitz were expecting to be out numbered in their “call to action” against an already created bike lane on Prospect Park West this morning. Bike Lane Protests and survey. You probably heard, last Friday there was a protest against Mayor Bloomberg’s aggressive campaign of putting in new bike lanes, with a target of the new one on 1st Ave. in Manhattan. Gothamist covered the action with this story.